A good skincare routine can be the difference between dull and glowing skin. 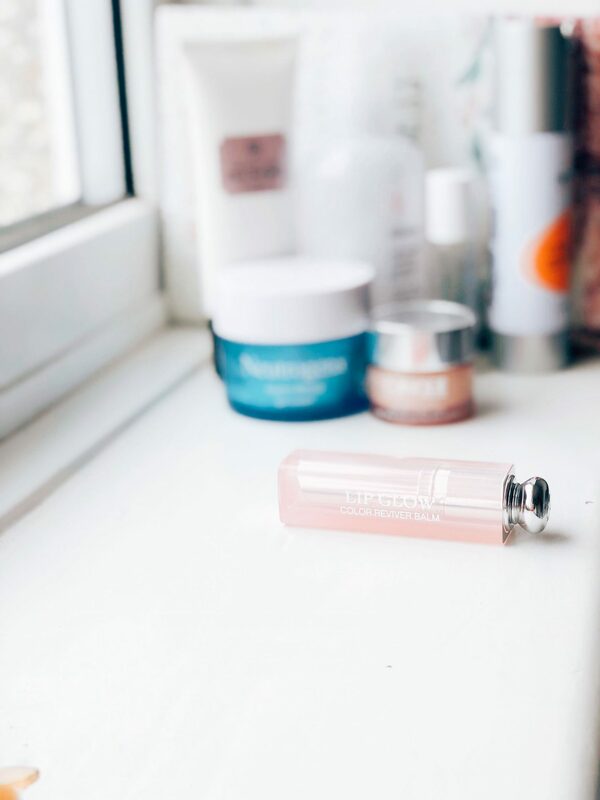 Following my current routine ensures my makeup stays on longer, my skin stays hydrated throughout the day and protected from ageing…that’s the plan anyway! I love the scientific side of how skincare products can treat your skin. I’ve been following this current skincare routine for about three months now, and I’m very happy with how my skin is at the moment. I’d no longer class it as ‘dry’, more normal! 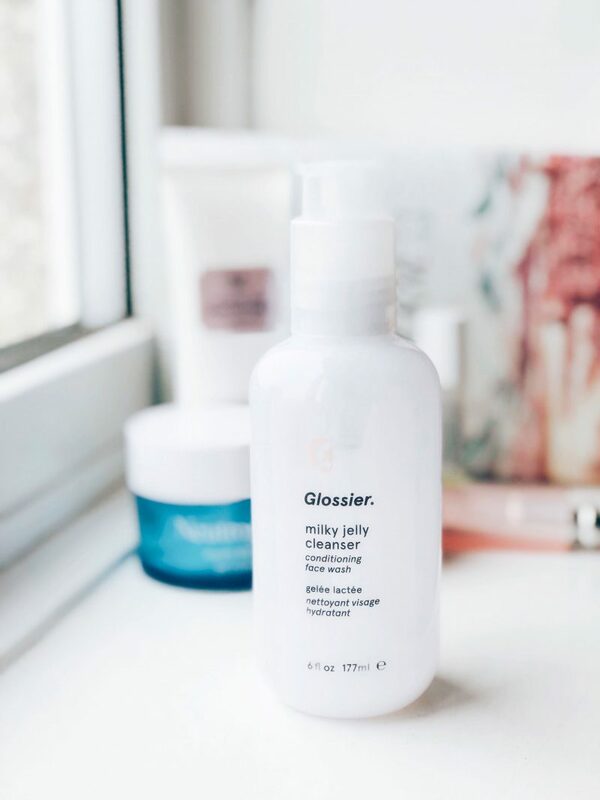 I start things off by cleansing with the Glossier Milky Jelly Cleanser. I’ve already made my way through plenty of these! The PH-balancing, rose cleanser is perfect first thing in the morning to gently clean my skin and prepare it for makeup. An extra tip is to wash away with a face cloth for extra exfoliation. Adding oil to my skincare routine in the morning has been the biggest change to my routine. I was always afraid it might cause makeup to slip and slide but when your skin is as dry as mine, there isn’t a risk of that! The right oil is key. I use the Rose Otto Facial Oil from Balance Me. I can’t recommend it enough. Applying a few drops massaged into your skin stimulates your skin and hydrates it ready for the day ahead. Next comes serum. 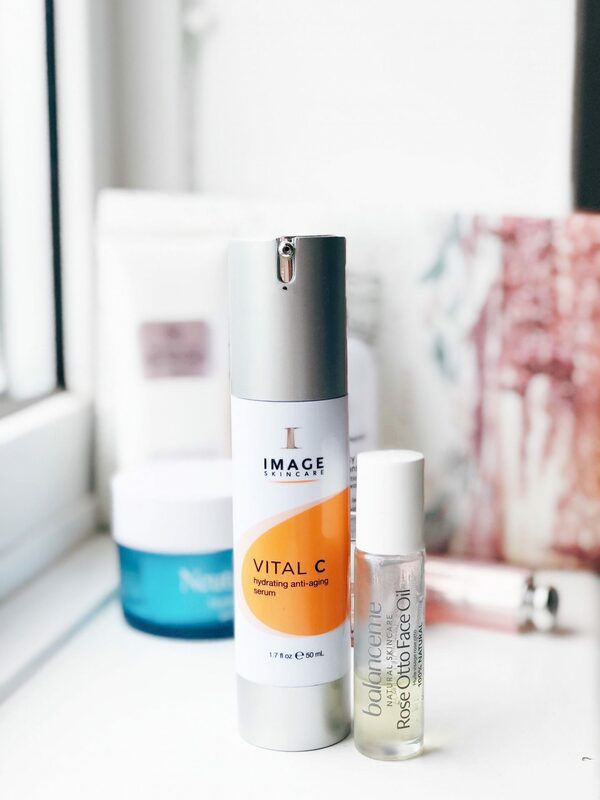 I use the Vital C Serum from Image Skincare. This bottle is packed with vitamin C, which is a powerful antioxidant. Helping to strengthen skin and fight aging, it sits beautifully on top of the oil. I’m impressed with how long this serum has lasted – I’ve been using a pump a day for many months and it is still going strong. Vitamin C is best applied in the morning, so I just use it once each day. Once the skincare that work deeper into the skin has been applied, I wait a couple of minutes before moving onto moistuiser. 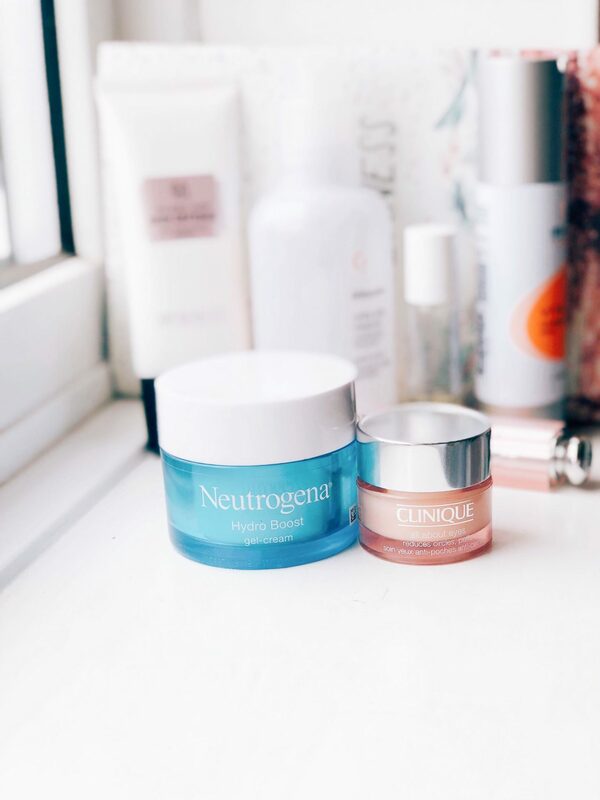 I adore the Neutrogena Hydro Boost Gel Cream. I’d go as far as to say that I think this would work for pretty much any skin type. The hydrating gel is so cooling on the skin. It sinks in quickly, providing an instant hit of water-based moistuisation. Ideal beneath makeup up too. 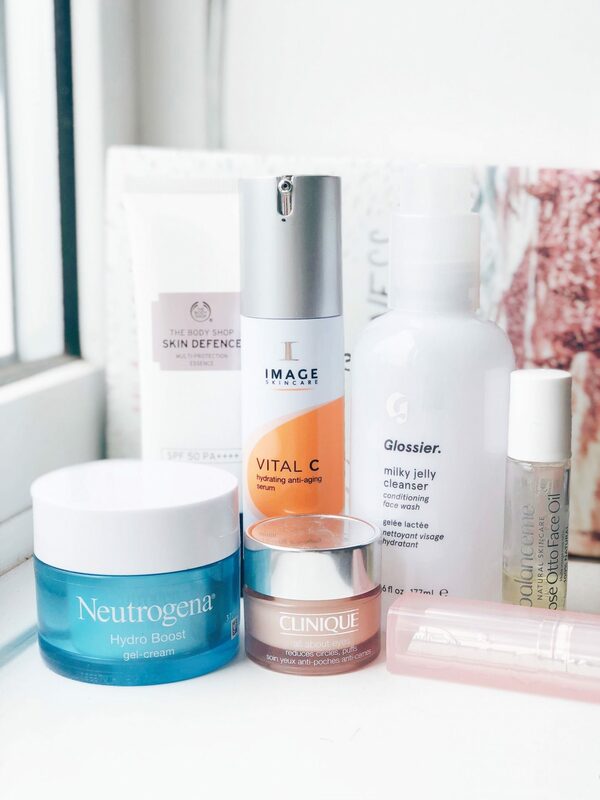 I went through a phase of skipping eye cream completely – I’m not sure it’s totally essential for a good skincare routine (although you could argue that this whole routine isn’t essential!). However, I’ve been consistently using the Clinique All About Eyes eye cream for a few months now and I’m happy doing so. The light cream is to be tapped around the orbital bone and helps mostuise the delicate skin beneath the eyes. I have been the number one fan of The Body Shop’s Skin Defence Factor 50 since it came out! I’d struggle to count how many bottles of this I’ve finished now; I constantly repurchase it. The lightweight moistuiser is a powerful sun protectant with Factor 50 protecting you against both UVA and UVB rays. It doesn’t affect the way makeup applies on top, doesn’t leave a white mask look to your skin and you can barely feel it. Protect your skin! Finally, I love using the Dior Lip Glow in 001 Pink to hydrate my lips and add a very sheer wash of colour. Perfect to keep applying throughout the day. So there we have it, my current morning skincare routine for summer. It completely relaxes me to sit for a few minutes and just gently apply the seven products. Self-care at its finest!